Mitch McConnell has 51 votes for a tax-cut bill. Now, all he needs is a tax-cut bill. Last night, it looked like there might be three Republican senators who genuinely cared about the deficit, at least a little bit. This was a big problem. There is no version of the GOP tax plan that delivers enough money to the wealthy to satisfy House conservatives — while providing enough of a pittance to middle-class families to appease Senate moderates — without also blowing up the deficit. But now, it looks like only Tennessee senator Bob Corker cares about the national debt as anything other than a tool for justifying unpopular spending cuts. 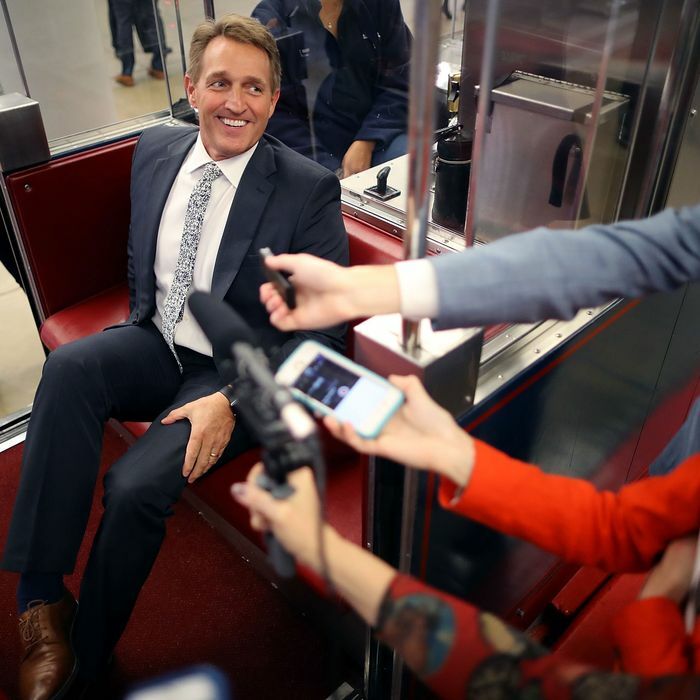 On Friday morning, supposed deficit hawk Jeff Flake announced that he would support the tax bill. Flake justified his decision on the grounds that he’d succeeded in getting an $85 billion “budget gimmick” out of the ($1.5 trillion) bill, while also securing Mitch McConnell’s heartfelt promise that he will get to ask Donald Trump — in person — not to deport 800,000 undocumented Dreamers. Me: Does that mean any agreement on timing (this year or no), substance? Short: No, it is to include him in our talks. Similarly, Susan Collins agreed to vote for the bill, after McConnell promised that House conservatives will definitely support new funding to shore up Obamacare — so long as she votes to destabilize that program by repealing its individual mandate first. McConnell also promised Maine’s favorite “moderate” that he will add a $10,000 property tax deduction to the bill. Currently, the GOP tax plan repeals the state-and-local tax (SALT) deduction in its entirety. Collins’s proposal — which is already in the House’s version of the bill — would mildly soften the blow of SALT repeal for Republicans in high-tax states like New York and New Jersey. Meanwhile, the Senate GOP leadership won over Wisconsin senator Ron Johnson by agreeing to make the bill $100 billion more generous to businesses like the one his family owns. As of this writing, it is not 100 percent clear how McConnell will pay for his expensive concessions to Johnson and Collins. In order to comply with his party’s budget resolution, the GOP tax bill cannot add more than $1.5 trillion to the deficit over the next ten years. Before these latest amendments, the bill’s price tag was already quite close to that sum. According to Bloomberg, Senate Republicans have agreed to finance the gift to Johnson’s family by raising the rates that multinational corporations will pay on their accumulated offshore earnings. It’s unclear exactly how much revenue this measure would actually raise. But the Congressional Budget Office will have no time to score the final bill. So, it will be up the parliamentarian to make an eyeball estimate of the hastily scribbled legislation’s cost (assuming that Republicans press forward and vote on a bill that still isn’t written by the end of today). Regardless, all signs suggest that there at least 51 Senate Republicans who are more invested in cutting taxes for their donors (and, significantly, themselves) than they are in upholding their putative principles. Susan Collins claims to care about her constituents’ health care; now, she is ready to vote to increase the number of Americans without health insurance by several million. John McCain has given jeremiads against the Senate’s abandonment of traditional parliamentary procedure; now, he’s prepared to vote for whatever unscored, undebated tax bill that McConnell decides to write over lunch. Jeff Flake has decried the debt as a threat to our grandchildren; now, he’s eager to vote to make that debt more than $1 trillion larger. Senate Republicans might not have a written bill. But they have the will. So, it’s a safe bet they’ll find a way.